Banjarmasin is a city that is all about its rivers and there are plenty of sights worth seeing are either in or alongside its waterways. For those that prefer staying on dry land there’s a number of pleasant riverside promenades available to enjoy the view from another perspective. The Raya Sabilal Muhtadin mosque can be found just across the road from one such riverside promenade as well, though unfortunately the gates were firmly locked on the day that I passed by. If you like getting up close and personal with monkeys then Pulau Kembang is deserving of a visit. 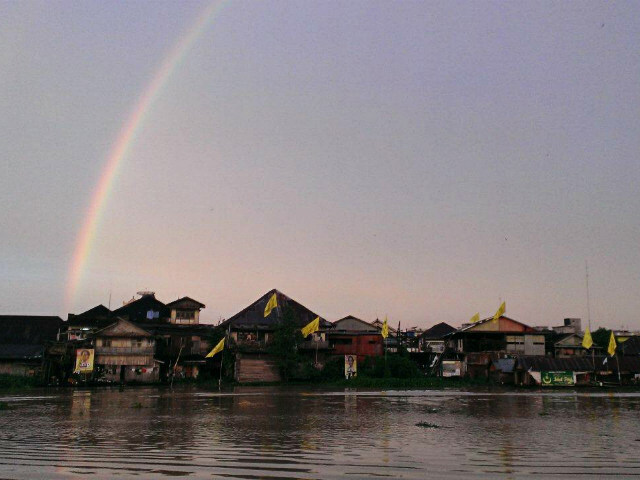 A small island located in the middle of the Barito River, it’s about a 30 minute boat ride from the city centre. The journey there is an eye opener as well, zipping down narrow canals past houses built over the water with people going about their daily life. 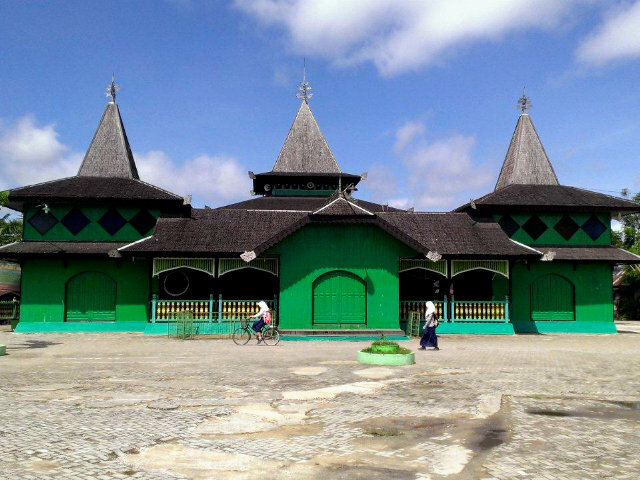 Along the way you also pass Sultan Suriansyah Mosque, the oldest mosque in South Kalimantan – certainly worth a stop to look around. Once you exit the canals though, especially if you’re in a small klotok boat, the immensity of the Barito River is quite awe inspiring. Perhaps not so suitable for those with a fear of water or an inability to swim though, especially given you’ll be sharing the space with immense coal barges and sizeable cargo ships. 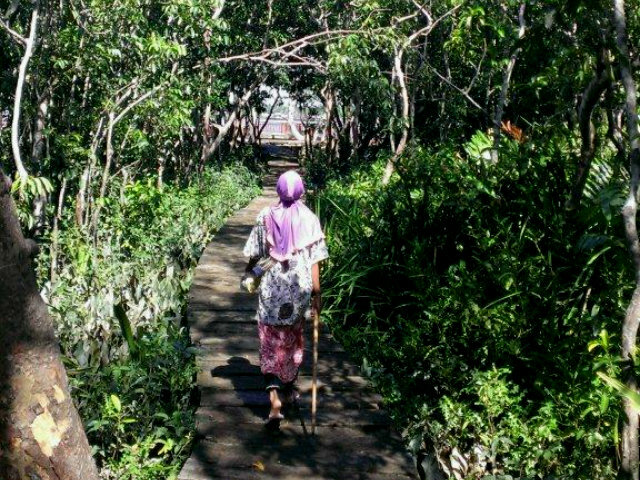 At Pulau Kembang itself the local guides will be happy to show you around and also have plenty of peanuts available to sell for you to feed the monkeys. As soon as those packs of peanuts are opened though you can be sure you’ll have yourself plenty of attention! 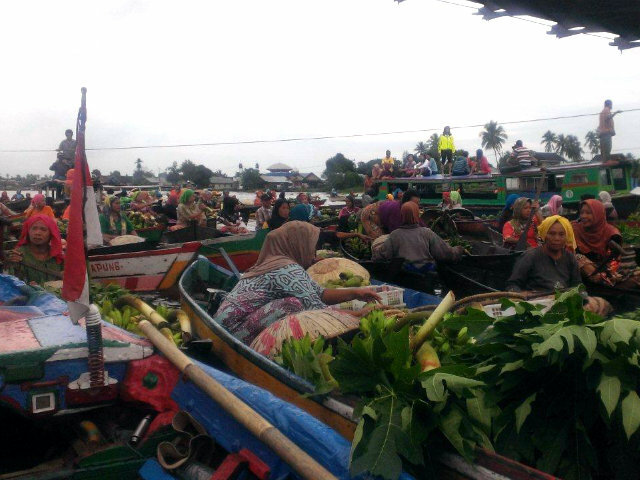 If instead you head up the Martapura river during the early hours of the morning all your senses can savour another experience, this one being the floating markets at Lok Baintan. The journey there takes about an hour and it’s fascinating to see the river waking up as the sun rises. Once you arrive at Lok Baintan you’re greeted by a multitude of boats all carrying their own specialities for sale or trade. An array of fresh produce is available, along with a selection of sweet and savoury snacks to sample to help satisfy the appetite after such an early start to the day. There are a number of dishes that Banjarmasin is famous for, amongst them Soto Banjar and Mie Bancir. You might have to poke your head into some quieter corners to find these dishes though; they generally don’t appear to feature on the menus of more upmarket establishments. One place that served up a particularly tasty version of both of these dishes was at Warung Ratna, just off Kolonel Sugiono street, near the city centre. If instead you have a taste for the sweeter things in life, Banjarmasin is famous for its Bingka and the delights from Wadai Banjar (located just outside Duta Mall on Ahmed Yani street) were particularly tasty. Unfortunately I gobbled mine up before I had the presence of mind to photograph it, which gives some indication of how delicious it is. That’s amazing! I have never been to Banjarmasin, but everytime I hear the name, it reminds me of that commercial with RCTI. The one with the floating market and it ends with one of the vendors giving a huge smile and a thumbs-up “RCTI OK!” 🙂 I should really travel the country more! Thanks for this! Haha.. 😀 I definitely still remember it as well. Hello!! You have a lot information about your country, thanks for sharing! What a charming place, especially the floating market. 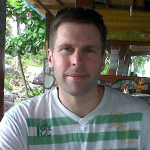 I went to Kalimantan many year ago, but only managed to visit the areas around Pontianak.